Nearly 180 pages of immediate-action drills for when everything goes to hell in a handbasket (SOF editors all keep a copy on their desk at all times). Succinct overviews and pity, practical courses of action from legion experts-in-their-fields, to fight Murphy at least to a draw. Aficionados in some fields might quibble over certain techniques, but for the amount of ground this compact volume covers in dealing with dozens and dozens of worst-case scenarios in common-sense fashion, it's well worth having. Odds are good you'll meet more than one of the situation during your life, and the time spent studying this volume may turn out to be some the best time you ever invest. If nothing else, it makes you think out your options beforehand, so you have a plan. 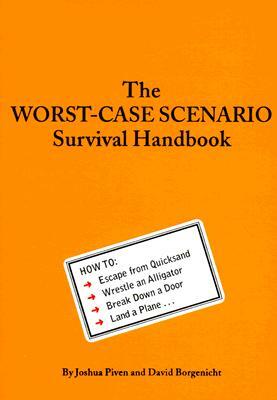 Those with deep-seated fears about killer bees, quicksand, mountain lions and sharks will enjoy The Worst-Case Scenario Survival Handbook by Joshua Piven and David Borgenicht, a handy little book for the extremely prepared that is climbing the best-seller list. This is a no-nonsense, no-fooling around guide with straightforward information. But fear not: The authors have enough perspective to acknowledge the campy appeal of an armchair guide for the anxious. "We thought it would be funny to people," Borgenicht says. They were, he says, "inspired by pop culture as much as by paranoia most of the scenarios we talk about were a TV or a movie scene." Sharks, the authors say, scared both of them to pieces in childhood. Blame it on Jaws.